Would you like to win a great book on beaded embroidery? Today I’m giving away a book called Beaded Embroidery Stitching by Christen Brown. Just leave a comment below and you may win a free ebook version of her book. I’ve never added beads to my embroidery work. Why you ask? Because if I get started, I may never stop! Those shinny glossy bits of glass are so tempting and I’m afraid I’ll soon become addicted. But if there is anything that would lead me into bead temptation it is Christen’s colorful book on beaded embroidery. She gives you terrific instructions on how to make basic embroidery stitches like the Lazy Daisy with beads. Pages are devoted to making flowers with stitch combinations, beaded edges, and the peyote stitch. But wait, there’s more! 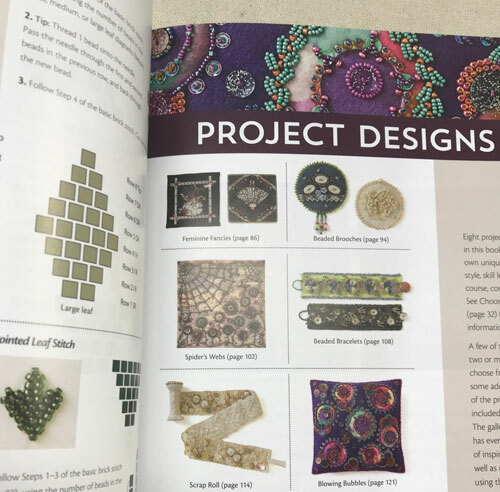 Eight projects are included with the book so you can put all that great bead knowledge Christen has given you to work. Create beaded broaches, bracelets, sewing caddies, and more. They are all beautiful and full of color and light. Christen has put together an informative book on beading that even a novice like me can understand. If you’d like a free ebook version of Beaded Embroidery Stitching , please leave a comment below. A random number will be chosen tomorrow. If you win, I’ll request your email address and send a link for the ebook. Good luck! More posts on the Beaded Embroidery Stitching blog tour are listed below. Note the dates. If you don’t win today you may have a chance to win on the following days or read the previous posts to learn more about the book. This entry was posted in embroidery by Laura. Bookmark the permalink. Hi, Laura. A friend is sending me beads from her stash, so the timing to win a bead book is perfect! I love Christen’s books. Looking forward to this new one. I use her other books on embroidery all the time. I love Christe’s Books. Looking forward to this new one. This looks like a beautiful book. I am always looking for ways to take my bead embroidery up a notch. The projects in her book are a lot of fun. I think you’d enjoy them. I have tons and tons of beads and buttons and have never used them because I’m afraid of spoiling the look of my work by doing it wrong. But I love how beaded embroidery looks! Her directions are excellent. She’ll guide you and give you confidence as you bead along. I have lots of beads, it would be a great way to discover how to use them. Her book has lots of information you’ll find useful, Elaine. You and I need to get our confidence up and give beading a try. I will, if you will! Thank you so much for this wonderful post, and being a participant in the blog tour. Good luck to all of the participants! Its a beautiful book, Christen. Congratulations! I love playing with beads, and using them on my Crazy Quilts, or in my embroidery. I have a pretty good bead stash, so Christen’s book would be perfect to help me whittle down my supply. Thanks for the chance to win. Beads are a great way to enhance embroidery. Her book has ideas for crazy quilters too. 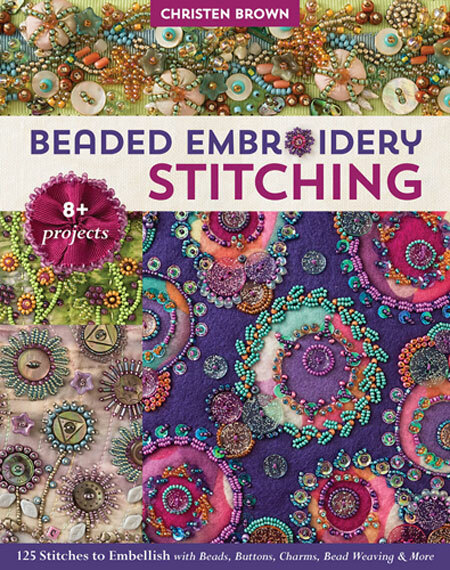 This books looks fantastic and I just bought beads recently to try my hand at bead embroidery. Would be very timely if I won a copy. Thanks! It’s a good book for beginners like me and for those who know what they’re doing. Yes, yes, yes! What a wonderful book to own! Fingers crossed I win! Thanks! Good luck Cindy! It is a wonderful book. I have tons of beads that I use for knitting – I’d love to learn how to add them to my embroidery work as well! Wow! I never thought of using beads for knitting. You have opened a whole new world for me Arlene! I love the look of these projects! Her projects are colorful and so beautiful. I love beading and embroidery. Sure hope to win this terrific E-book. Beading and embroidery… a great combo and Christen does a great job of showing how its done. I use beading in a modest way, combined with LW hand-dyed thread (of course!). My SAQA donation this year uses both. Wow! Thanks for using my hand dyed threads, Susan. And thank you for donating to SAQA, one of my favorite textile organizations. What’s not to love about beads? They bring out the dragon in me. Thank you for visiting my blog, Sue. I have lots of beads, but not many examples of beadwork. This book would be perfect. The book covers a lot of information. I think you’ll find it helpful. loved her prior book. thanks for the opportunity. Christen’s work is gorgeous! Thanks, Laura. I see some great idea’s in this book. What a wonderful prize. “Well hello Laura, looking swell Laura”…you’re such a bad influence! Singing, fusing, dyeing, embroidery on silk, embroidery on wool…and now Kristen’s new beading book!! Perfect addition! Be thee not scared…try it, you’ll like it! Thanks for keeping our addictions going! I have lots of beads and I have lots of buttons. What a great way to use them together. Books like this provide such inspiration to create. Thanks for the chance. What a beautiful book! Thanks for the chance to win! I love the look with beads and would be happy to give it a try with this great book! Thank you! That would be a fun book to have. As one who loves to bead Embroidere, I would love to add this book to my library. I love beads and have a lot of them, I would love to have a copy of this wonderful book! This looks like the perfect next reference book to add to my library! Beads are soooooo much fun!